For your child's safety and health Mee Mee's Anti-Bacterial Baby Liquid Cleanser can clean everything that your baby uses - from washing bottles, to accessories, to toys, to fruits and vegetables as well. Mee Mee baby accessories vegetable liquid cleanser is carefully made to the highest safety standards. Mee Mee's Baby Liquid Cleanser is gentle enough to clean your baby's bottles, accessories, toys, vegetables and fruits in an all-natural way. Besides, the cleanser is fully biodegradable so that you preserve the environment while giving your baby utmost care and is the is the ultimate natural cleanser and essential for baby's health. Explore the entire range of Feeding and Nursing available on Nykaa. 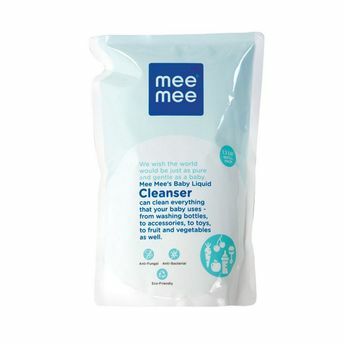 Shop more Mee Mee products here.You can browse through the complete world of Mee Mee Feeding and Nursing .Alternatively, you can also find many more products from the Mee Mee Anti Bacterial Baby Liquid Cleanser Refill range.